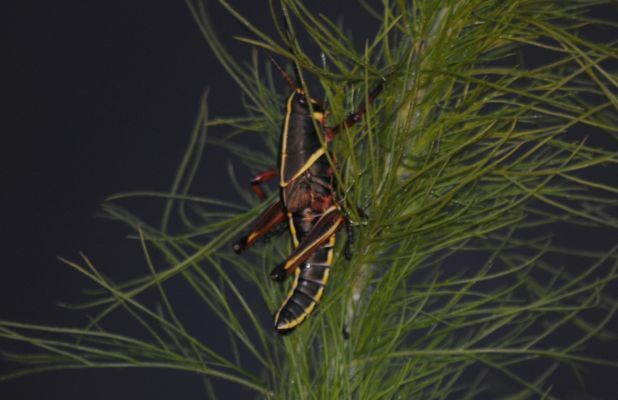 Eastern lubber grasshopper, photographed near Grassy Waters Preserve, West Palm Beach, Palm Beach County in May 2014. The eastern lubber grasshopper, Romelea microptera, or if you prefer R. guttata, can't fly — its wings are only a fraction of its body size. It has no jumping skills whatsoever, and it crawls as much as it walks. Its name derrives from the Old English word "lobre," meaning lazy or clumsy. Add to that the lubber's bright colors and large size, and you'd think it's a meal, ready to eat for a bird, a possum, or some other creature that has bug on its menu. Well, in the immortal words of ESPN football analyst Lee Corso, "not so fast, my friend." While it's not likely to out-quick a predator, it's not likely to have a need for speed. Those bright colors are a warning signal to most any predator, "you eat me, you're going to die." Or at least become deathly ill.
Lubbers, it turns out, are toxic to most creatures. It also can secrete a foul and irritating spray or foam to ward off anything that doesn't get the message. There is an exception: the lubber's toxins don't seem to bother loggerhead shrikes in the least. Lubbers range from North Carolina to Texas. They like open pine woods and fields. They can vary in color from mostly black with orange and yellow markings, to mostly orange or yellow with black markings. They can vary in color according to their stage in life. According to University of Florida entomologists, lubbers can occur in such numbers that passing cars can smoosh enough crossing a road to create a slick. 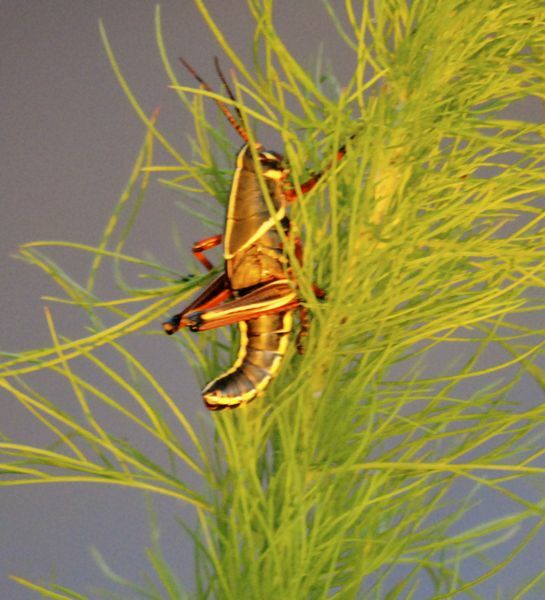 Lubbers produce one generation per year, with the eggs hatching in February in South Florida, later in spring further north. In summer, females dig a hole in the ground and deposit their eggs in a foamy substance. The young will emerge from the ground the following spring, which, in South Florida, means February and March. Younger lubbers generally are darker colored, lightening as they age. They go through five "instar" stages before finally molting into an adult. The body length can exceed three inches, but their wings, even fully matured won't be large enough to lift them off the ground. Although they have relatively few predators, lubbers can be afflicted by a number of parasites to an extent large enough to affect their populaton. When it comes to eating, they are generalists, but can be a particular problem for citrus growers. Despite their huge size, lubbers don't do as much damage as some smaller species. Other names for this bug include Devil's horse, diablo, black diablo, graveyard grasshopper and giant locust. R. Guttata, by the way, is another, less used scientific name for the lubber. These photos were taken in April at Loxahatchee National Wildlife Refuge. Photo at left: You can see the lubber's small wing about midway on his body, just below the diagonal yellow line.